The first success I got in calendar 2017, Mark Rypien was kind enough to sign 1 of 3 cards I sent him. 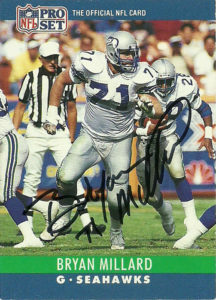 He inscribed the one card with Super Bowl XXVI MVP, which I thought was still cool. Rypien’s family drips with athleticism. His daughter has carried on in his footsteps and is a quarterback in the Lingerie Football League, while his Nephew, Brett is a starting quarterback for Boise St. In 2014 the Washington Redskins inducted Mark into their Ring of Fame. Rypien spent eight seasons with the Redskins. 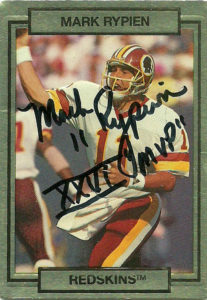 From 1986 to 1993 he started 72 games for the Redskins, completing 1,244 passes for 15,928 yards and 101 touchdowns. 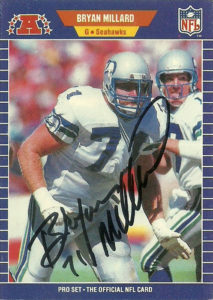 Modestly, Rypien dedicated his enshrinement to his teammates and the 55,000 or so fans that showed up every week to cheer on the team during his magical 1991 Super Bowl and MVP run. Cierre Wood was a solid runningback for the Notre Dame Fighting Irish from 2010-2013. In his Sophomore year he led the team with 603 yards on 119 carries, scoring 3 TDs. He also displayed nice hands out of the backfield with 20 receptions for 170 yards and 2 TDs. Cierre put together a solid Junior year, with 1,102 yards and 9 TDs on 217 carries. He returned for his Senior campaign in 2013 and posted 742 yards on 114 carries. Scouts were underwhelmed by Wood’s blocking, questioned his ball security, and were concerned about a suspension for breaking team rules during his Senior season. He went unselected during the 2013 NFL Draft. Cierre signed with the Houston Texans for 2013. 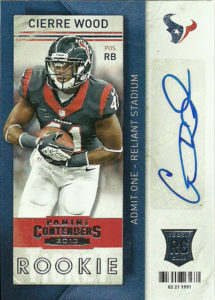 The Texans were in transition at runningback and beginning to seek a future heir for Arian Foster. With Foster oft-injured, Ben Tate locked into the second string job and the departure of Justin Forsett to greener pastures, it was a straight up battle between Dennis Johnson, Cierre Wood, and Ray Graham for the 3rd back spot. In the end Wood won out on the runningback derby. The Texans kicked off the season 2-0, but then dropped the next 14 games. It was really a snakebitten squad. Injuries abound, quarterback issues, Kubiak having a heart attack during a game- it was just one thing after another. In the midst of the descent Cierre was released with two other players for violating unspecified team rules. He’d finish the season on the practice squad of the New England Patriots. In 2014, Cierre spent some time on the rosters of both the Baltimore Ravens and Seattle Seahawks. He joined the Buffalo Bills in 2015 but blew out an ACL, ending his season. Wood rehabbed and decided to give the CFL a shot, signing with the Hamilton Tiger-Cats in 2017. 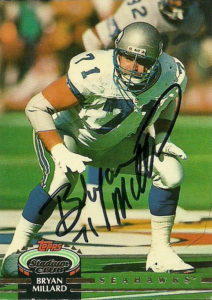 In early May he was traded to the Montreal Alouettes but did not make the squad. Panini’s Contenders set is always pretty solid. I found the split design of this particular card to be both daring and unique as there are very few column grid cards like this one. The photo is touched up well and it’s a solid action shot of Cierre. 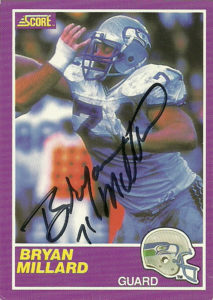 Even the typography of this card looks good, and there is plenty of space for the autograph.